Sometimes I'm a little slow on the uptake. I recently just had soba for the first time, and I don't know why I waited so long to try them, but I'm very glad that I did. Soba is Japanese for buckwheat, and that's exactly what these noodles are. The thin, chewy, buckwheat noodles have a distinctly nutty flavor, unlike any other noodle that I had tasted before. Needless to say, I was hooked at first bite. Traditionally soba is served in a hot broth, or cold with a light dressing or dipping sauce. I chose to take the cold route for the colorful winter salad. Hearty greens and citrus are bountiful at our local farmers market this time of year, and while I tend to easily grow tired of what seems to be an eternity of kale, this salad rejuvenates my love for all the great produce that winter has to offer. I should also mention, although I hate to admit it, that this dish is 100% vegan. It felt wrong just typing the word, but I promise you that this recipe is so packed full of flavor that you'll forget all about that steak you wanted to eat for dinner tonight. This winter soba salad is made of several components, all with different flavors and textures. Roasted butternut squash adds sweetness to the tangy, pickled watermelon radish and umami flavor of the sautéed shiitake and yellow oyster mushrooms. Throw in some baked tofu and kale for crunch, top it all off with a sweet and salty miso-grapefruit dressing, and your soba noodles were never in such good company. In a small mixing bowl, combine all the dressing ingredients except the oil. Then, slowly whisk in the oil until combined. Set aside to let the flavors meld until the salad is ready to be assembled. In a bowl, dissolve 1 1/2 cups of salt in hot water. Place the tofu in the saltwater, and set aside for 15-20 minutes. Discard the water, and pat the tofu dry with paper towels. In a small bowl combine the rice vinegar and 1/2 tablespoon of salt. Stir until the salt has completely dissolved. Place the sliced radish in the vinegar/salt mixture, and set aside until ready to assemble the salad. In a large bowl toss the tofu and squash in a small amount of olive oil (approximately 1-1 1/2 tablespoons), and arrange the pieces on a baking sheet in a single layer. Bake for 20-25 minutes, turning occasionally, until the tofu and squash are brown and crispy on all sides. Remove from heat and set aside until salad is ready to be assembled. sauté for 5-6 minutes, until browned on all sides. Next, add soy sauce, 1 teaspoon of rice vinegar and sherry, and cook mushrooms until the liquid is gone. Season with salt and pepper as needed. Remove from heat and set aside until salad is ready to be assembled. 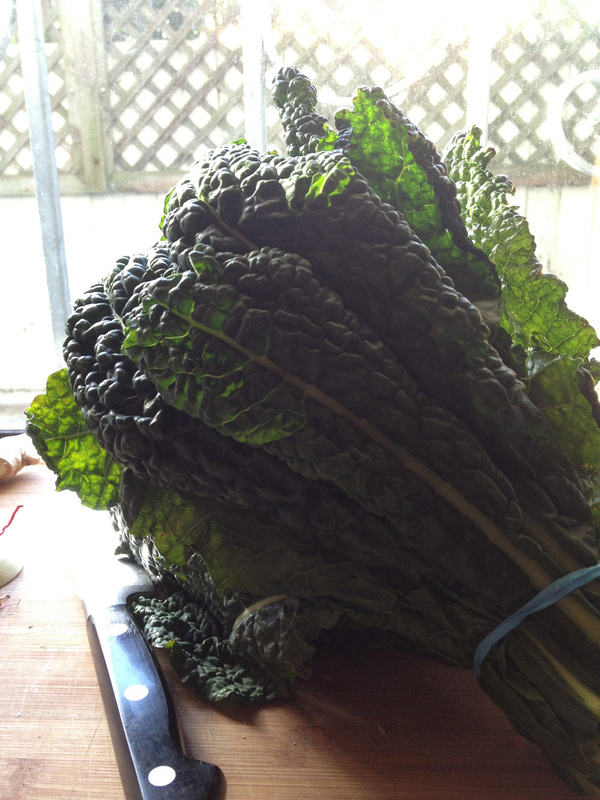 In large bowl season kale with salt and 1 tablespoon of olive oil. Massage the oil into the kale until all the leaves are evenly coated. Next, drain the radish and discard the pickling liquid. Set aside until the salad is ready to be assembled. Boil and drain the soba noodles according to the instructions on the package. While the cooked ingredients are still warm, toss the noodles, tofu, squash, mushrooms, pickled radish, and kale in a large salad bowl. Add the dressing to the salad mixture a little at a time, until everything is well coated. Arrange the salad on a large serving plate, and garnish with the black sesame seeds and sliced green onion.